The ethics of leaving gear in the mountains or at the crag is complex. Some might consider anything left behind anywhere, akin to abandoning gear. Indeed, some National Parks and the Bureau of Land Management identify any gear left behind for any reason at all as abandoned. So under these draconian policies, if you leave a tent up on a mountain, hike down to your car to do a resupply, and then bring your food back up, a ranger could decide that you've abandoned your tent. And while resupplying is not a common tactic, it definitely happens to some extent in every mountain range in the country. There are three tactics that climbers regularly employ that require them to leave equipment unattended for -- potentially -- extended periods of time. These include fixed ropes, caches, and fixed draws. 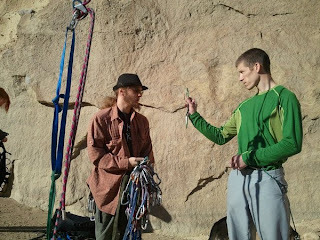 And unfortunately, not every climber is educated on the ethics of these issues, so sometimes gear is stolen. Aid climbers commonly fix lines on big walls. They will climb as high as they can, fix ropes and then rappel to the ground and return to camp. Their ropes will remain fixed in position. The following day, they will climb up the rope with mechanical ascenders to reattain their high point. These lines are regularly unattended at night and sometimes during the day. Obviously, these climbers are trusting that the equipment will not only be there when they return, but also that nobody will have messed with it creating a dangerous situation. Mountaineers fix lines on steep and exposed snow or ice slopes. These types of ropes tend to be set-up by guides or by large expeditions that need to get a lot of people through a dangerous section quickly. Fixed ropes in a mountaineering setting are almost always left on popular trade routes that require them. However, occasionally a person will leave a fixed line on a less popular route to help facilitate quick movement early in the morning. 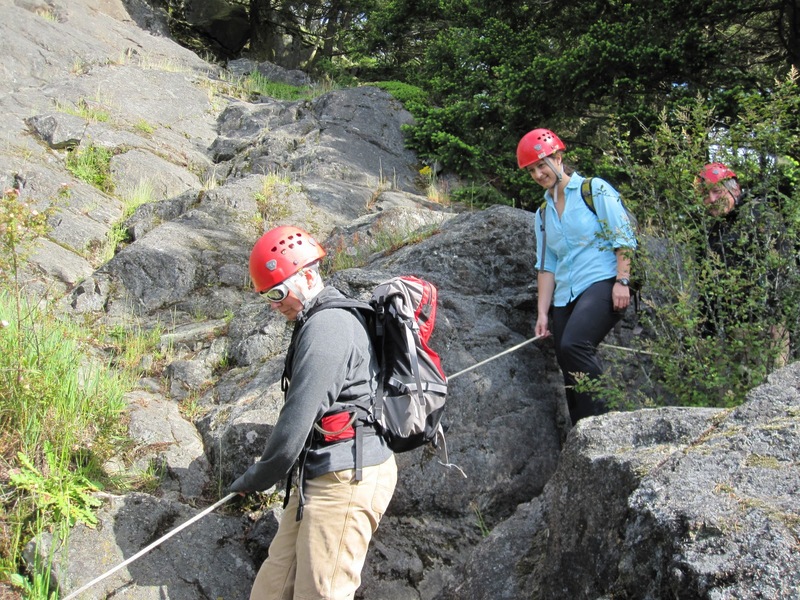 Occasionally, large groups will set short fixed lines at cragging areas to help beginners safely move up and down a sketchy section. Unlike the other examples, these lines are unlikely to ever be left unattended for more than a couple of hours. In many mountaineering and expeditionary settings, a food or gear cache is an important part of a team's strategy. Commonly these cache's are buried in the snow and marked with wands or an avalanche probe. If such a cache were to disappear, it could mean the end of an expedition...it could also be very dangerous for those who were expecting it to be in place. It is the responsibility of those who employ the use of fixed lines and caches to clean them up when they are done. If they don't, this creates a negative impression about climbers with land managers and the public. If land managers know who abandoned a cache (in a place like Denali National Park), they will impose a fine. Additionally, climbers who permanently leave these types of things behind provide a better argument for the ethically challenged to steal your cache or your fixed line. Many high-end climbers (5.11-5.15 climbers) regularly employ the use of fixed draws on their projects. In other words, they leave draws fixed on hard bolted sport climbs so that they can easily come back in order to continue working on the ascent of their routes. Many sport climbers will come back to the same climb over and over again, sometimes logging weeks or even months, working to successfully complete their climbs. This technique of "working" a climb used to be looked-down upon, but has become the norm for people trying to climb very difficult routes. The technically hardest rock climbs in the world are now regularly being climbed this way. The issue with this technique is that it is now common for climbing draws to be almost permanently left on hard climbs. There are two problems with this. First, some land managers don't like the nearly permanent installation of these draws. And second, the fact that these draws have been left behind provides a major temptation to individuals who don't know any better and for thieves. There are many climbers out there who don't like the fact that there are bolts in the rock. And there are many climbers out there who really don't like the fact the bolts have draws permanently affixed to them. But when all is said and done, regardless of your beliefs about this issue, if you know that the draws have been set to assist in a climber's ascent, then taking them is stealing. There is controversy around each of these three topics. But fixed lines, caches and fixed draws are an important part of many climbers experiences and it is important to respect those who choose to employ such tactics as long as they do it in a way that is in line with a local climbing area's ethics.